Flatbed Trucks FBT usually are used for inhouse transport of heavy goods of any kind with bigger base areas, for purpose of storage, for shipment or for further machining. 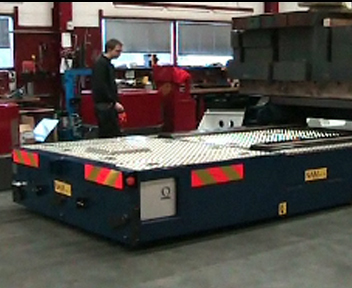 One main use of Flatbed Trucks FBT is the transport of big machines / components from station to station within flow production lines. Within a flow production line, different from an assembly belt line, the goods to be assembled are not driven continuously, but moved form station to station within special cycles. Staying at the single station can take up to several hours.The products to be produced within such a flow production line, can have a weight of 100 tons or even more and they are produced on so called "Transport Pallets". The Flatbed Trucks FBT drive below the transport pallets and lift the transport pallets including the products staying on the pallets. Then they transport the products on the transport pallets to the next assembly station. The advantage of such Flatbed Trucks FBT in case of flow production, compared to railbased transport systems, is the dramatically better flexibility. You can add further assembly stations at any time, you can modify the transport routes within shortest possible time, as you do not need to move any rails within the floor. 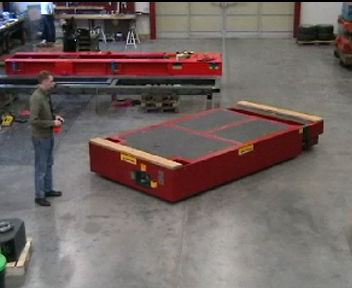 If needed, you can transfer complete production lines from one plant to the other within shortest time or you can change the production capacities between your single lines or plants by changing the distribution of the Flatbed Trucks FBT. So you easily can adopt your capacity to the capacity utilisation of your single line or plant. Flatbed Trucks FBT also are available as telescopic versions to be adopted to the different lengths of planned heavy load transport goods. • Several Flatbed Trucks FBT can be moved at the same time by one "Master" Radio Control"
Please let us know your task you would like to be solved by such Flatbed Trucks FBT. We will provide you with an interesting solution.